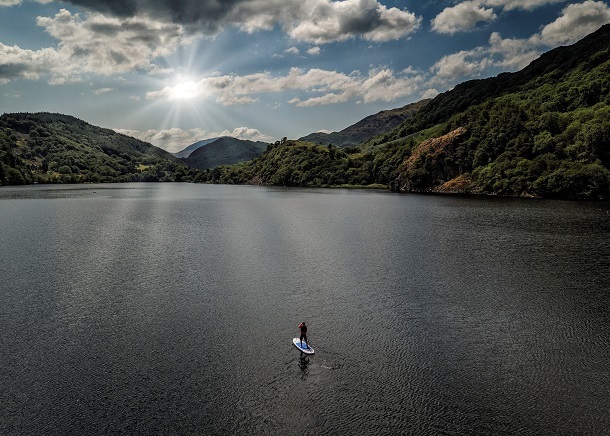 The Wales Way are three iconic routes that take you through the best that Wales has to offer. The Coastal Way which skirts Cardigan Bay from St. David’s in Pembrokeshire to Aberdaron at the far end of the LlŷnPeninsula, The Cambrian Way which goes through the heart of Wales from Cardiff to Llandudno, and The North Wales Way from Queensferry in the East to Holyhead in the West. In Gwynedd, we are lucky that all three pass through the county, with many highlights on the routes themselves, and some well worth a short detour. Download the PDF to view the many highlights along the routes. The Coastal Way runs in an unbroken sweep along Cardigan Bay through the counties of Gwynedd, Ceredigion and Pembrokeshire. It’s a stunning seaside road trip with serious star power. Stretching from Aberdaron on the tip of the wild Llŷn Peninsula in the north to the miniature city of St Davids in the south, it’s an epic coastal journey through an Area of Outstanding Natural Beauty, two National Parks and protected Heritage Coast. 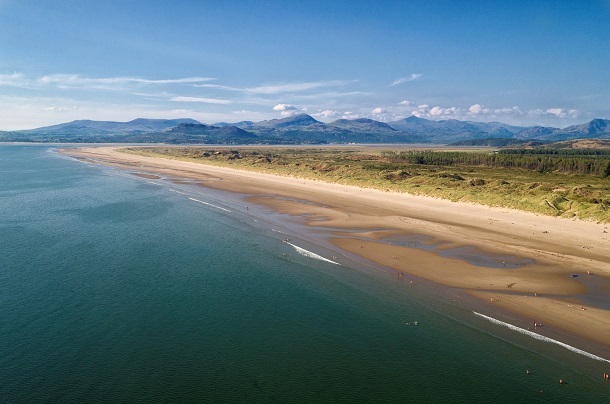 Along the way you’ll encounter an unmistakably Welsh landscape of sandy beaches, pretty harbour villages, sublime estuaries, hidden coves and mighty castles. 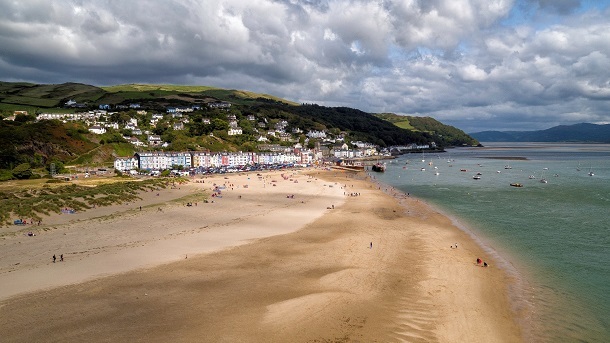 Here we’re featuring over 100 miles of the Coastal Way, extending from Aberdaron (the deeply Celtic ‘land’s end’ of Llŷn) in the north to the cosmopolitan little resort and sailing centre of Aberdyfi and the Dyfi Estuary in the south. It lies within the area known as Snowdonia Mountains and Coast in the county of Gwynedd. Wildlife-rich Bardsey Island, the holy ‘Isle of 20,000 saints’, lies just off Aberdaron. Nearby Plas Glyn-y-Weddw at Llanbedrog combines amazing art with beautiful gardens. 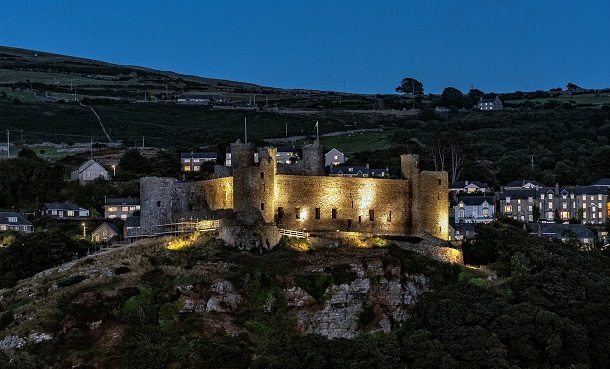 The battle-scarred ruins of Criccieth Castle occupy a prime spot overlooking Cardigan Bay. 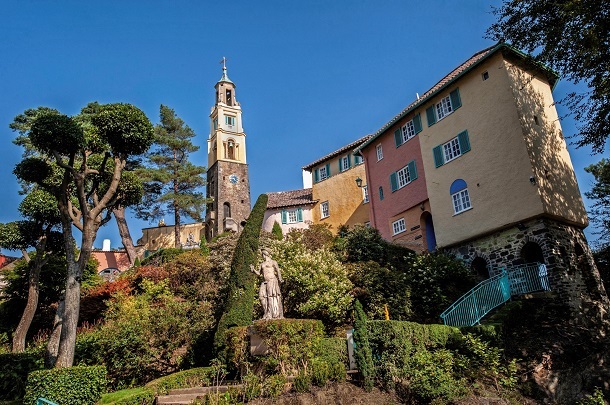 Then comes the magical – some say surreal – village of Portmeirion, an Italianate fantasy of brightly coloured cottages and unique architectural flourishes set on the water’s edge. Harlech Castle (a UNESCO World Heritage Site) commands huge views across Snowdonia’s mountains and coastline, as does Dinas Oleu, which became the National Trust’s very first acquisition back in 1895. 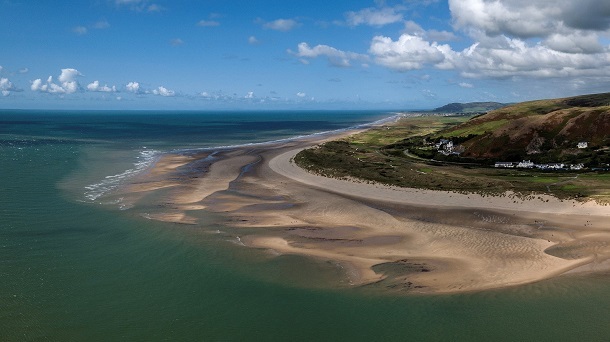 Take the short, steep walk from Barmouth up to this inspirational headland and you’ll be treated to grandstand vistas of Cardigan Bay and the lovely Mawddach Estuary, where mountains meet the sea. Picturesque Aberdyfi lies at the mouth of another alluring estuary, carved by the swirling waters of the River Dyfi. As you travel, you’ll find a great choice of places to eat and sleep, plus a huge range of outdoor activities (everything from walking and wildlife spotting to watersports and cycling). And if you don’t fancy driving let the train take the strain by riding the scenic Cambrian Coast railway along the northern shores of Cardigan Bay. That’s not all. Our Coastal Way also runs close to many other places to visit that make for great days out, including Snowdonia’s Zip World attractions, the activity-packed Coed y Brenin Forest Park, iconic Caernarfon Castle (another World Heritage Site), the National Trust coastal village of Porthdinllaen and the National Welsh Language and Heritage Centre at Nant Gwrtheyrn. From Snowdonia Mountains and Coast the Coastal Way runs through Ceredigion to north Pembrokeshire. Don’t miss out. Follow the road all the way.